Shop Pendants | Rocks & Co. The pendant derives its name from the French word pendr, meaning to drop down. In jewellery, a pendant is a dangling element attached to an earring, bracelet or necklace. Pendants created in various sizes shapes and forms are deceptively simple accessories that have been worn by humans for centuries. Pendants are one of the oldest forms of jewellery known to mankind. The earliest examples were formed out of bone, stone, wood, shell, ceramic, animal teeth, claws and other natural materials. Some current versions still include some of the above materials but we will focus on pendants made using precious metals and genuine gemstones. Medallion pendants are coin inspired discs. They can be a large, small, to very small jewels made of sterling or gold with various finishes. Medallions include virtually any design that can fit on the disc. 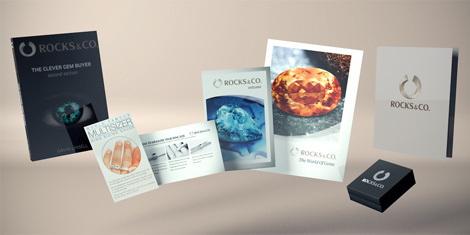 As well, very popular designs are discs of precious metals sans imprint or design. Just a beautiful un-embellished precious metal disc in matte or with a high polish hung on a chain or chord. These fine medallions can and often are worn daily. Some designers have incorporated medallion style crests into their clothing and belts and various accessories. Amulets are worn for energizing against ill health, and misfortune. They are objects of protection for the wearer. Many Auyervedic Doctors and new age energy healers use crystal and gemstone pendants in their practices. The creation of birthstones have as well, contributed to the widespread belief in the “life” of gemstones. Jade has been thought of by Greeks, native South Americans and the Chinese, to have powerful medicinal properties, and white Quartz’s use to clear negative energy are examples of the believed powers of gems. A talisman is an ancient form of the pendant in which the object is thought to endow the wearer with active powers of fortune and luck. According to wiki the difference between an amulet and a talisman is that the talisman enables the wearer with powers and the ability to perform actions. The amulet is for self-protection. Many advise wearing Rose Quartz to attract love and for clearing heartbreak, Moonstone – is looked to for energetic support of passion, love and inner strength, and Sapphire is thought to fortify love and fidelity. Lockets are vintage or vintage influenced slim hinged two-sided box pendants that are normally made of precious metals, and sometimes include gemstones in the design. The secret is that they can hold a photo, a message, a lock of hair, or whatever special object that can fit in its centre. Traditional shapes are heart, round, oval and square-shaped engraved with ornate designs on the surface. A more contemporary finish is a simple smooth matte or polished surface. Men have been wearing pendants for a very long time! In fact, there is a huge array of contemporary men's pendants with designs that borrow from ancient societies and tribal styles including; Celtic, Viking, Asian, African, Mongol, Mauri, right up to military-style dog tags. The fierce animal teeth are now created out of precious metals, stones or man-made materials. Contemporary pendants for men seem to give a look of peaceful but definitive strength to the wearer. Many symbols of brotherhood, strength and camaraderie or spiritual commitment are present in men's pendant and jewellery designs today. Men are a bit serious about their jewels! Whether created using white pink or yellow gold, gold pendants can be like wearing a little bit of sunshine on your neck. They stand alone as a medallion shape, heart, pear, oval and of course can be found created with gemstones like Apatite, Aquamarine, Beryl, Diamond, Emerald, Garnet, Moonstone, Opal, Pearl, Quartz, Sapphire, Topaz, Tourmaline, and Zircon. Do you want to make your own jewellery but don't really have the time to go to a jewellers school? The easiest way is to collect charms and a few chains and voila! You are a jewellery maker. Well, not really but you do have the chance of being creative and of assembling something sweet out of separate parts. The cool thing about charm pendants is you can add them as you go along and change them up depending on what you fancy at the moment. Some functional pendants include the traveller's sundial used to tell time from the sun which is both beautiful and useful. Monocles aka magnifier pendants, popular amongst Sherlock H. fans are great for menu reading. Mini vintage or vintage style pocket watches make for an elegant and useful pendant necklace. Last but certainly not least are crystal or metal pendulums used for hypnotism, talking with the 'other side' for advice, as part of the timekeeping mechanism of wall clocks and of course as jewellery. Now that's useful!